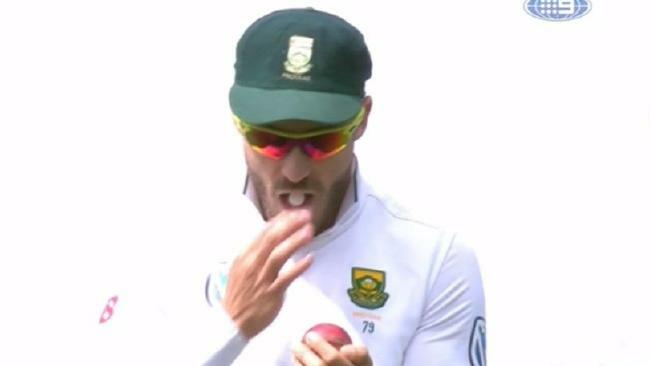 Faf du Plessis was caught altering the condition of the ball with a mint in 2016.
INTERNATIONAL Cricket Council chief executive Dave Richardson is not buying into talk that players are unaware what constitutes ball tampering. In a wide-ranging speech focused on the importance of the spirit of the game, Richardson spoke at length on ball tampering at the MCC Spirit of Cricket Cowdrey Lecture at Lord's. "If you are wearing sunscreen, sucking a mint or chewing gum with the intent of using the cream or sugary saliva on the ball, you are ball-tampering," Richardson said. In March, Cricket Australia handed Steve Smith and David Warner 12-month bans from international and domestic cricket for their roles in the Cape Town ball-tampering saga. Cameron Bancroft was banned for nine months for the same scandal - he was found to have used sandpaper on the ball. In contrast, the ICC suspended Smith for only a Test, and Bancroft was hit with a fine and a final warning. Such disparities are less likely to happen in the future as last month the ICC toughened its stance on ball tampering, increasing the act to a level-three offence, which can garner up to a six-Test suspension. 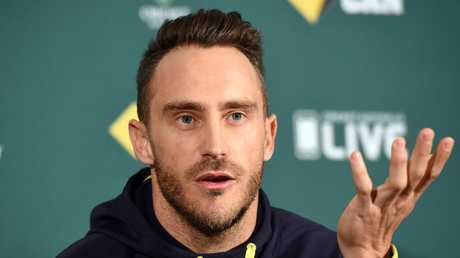 However, some in the cricket community believe it is unclear what constitutes ball tampering - including South Africa captain Faf du Plessis, who was fined 100 per cent of his match fee for using mints to change the condition of the ball in the 2016 Hobart Test. "I think it's important to say that I'm not clear yet on that matter (of tampering)," du Plessis said in July. "The ICC has made the penalties a lot more strict, but they still haven't said what is allowed and what isn't allowed. Is chewing gum allowed? Is it not? Are you allowed mints in your mouth? "For me, I need clarity still. I'm looking forward to speaking to the umpires before the game to make sure there's clarity. I'm sure that Dinesh (Chandimal) would as well." Sri Lanka skipper Chandimal was given a one-Test ban for ball-tampering after being caught on camera putting applying an artificial substance to the ball. Richardson is not buying the confusion. "Over the last few months I've read comments from players requesting guidance on what is allowed in relation to the ball - asking if they can chew gum, wear sunscreen or drink a sugary drink, and to be brutally honest, I find this a little disingenuous," he said. "The laws are simple and straightforward - do not change the condition of the ball using an artificial substance. If you are wearing sunscreen, sucking a mint or chewing gum with the intent of using the cream or sugary saliva on the ball, you are ball tampering"
The ICC chief said things such as mints and lollies would not be banned. "You may not always get caught, we are not going to stop players chewing gum or from wearing sunscreen," he said. "There are many players who have chewed gum on the field throughout their careers and never once thought to use it on the ball, but if you are caught - and we have only caught players when it is pretty obvious what they are doing - then don't complain. 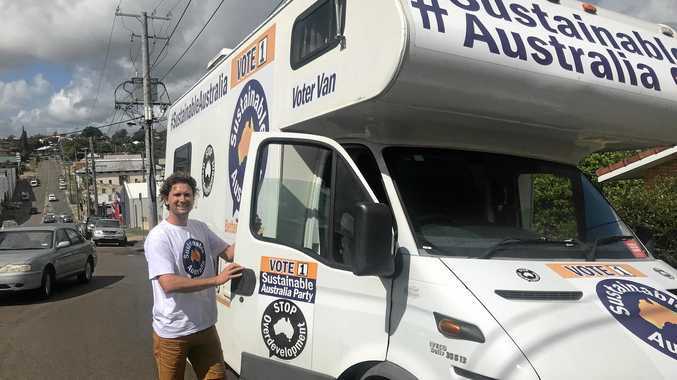 "Saying others do it is not a defence - you are cheating." In the past six months cricket's image has been tarnished by a flurry of ugly incidents. Bangladesh threatened to walk off in March in a tense one-dayer against Sri Lanka after an umpiring decision did not go its way. A month later, Sri Lanka refused to take to the field for two hours against the West Indies in protest after Chandimal was charged with ball tampering. And the high-quality cricket played between South Africa and Australia was overshadowed by sledging, an off-field confrontation between Warner and Quinton de Kock in the players' chase, and Kagiso Rabada's shoulder bump on Smith. 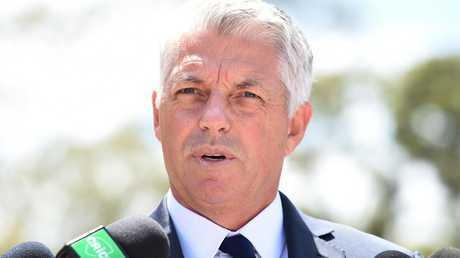 Richardson said that both administrators and players had to step up their efforts to lift the standards of the game, pointing to the South Africa-Australia series as proof the public would not stand for any more. "The spirit of cricket isn't an historical hangover - it is part of the fabric of our sport. No other sport has codified the spirit so blatantly in its Laws, and we disregard it at our peril," Richardson said. "The phrase 'it's just not cricket' is not an accident, it's because cricket's DNA is based on integrity and people know that cricket represents something more than a game. "We have seen too much behaviour of late that puts that in jeopardy and it has to stop. "Sledging that amounts to no more than personal abuse, fielders giving send-offs to batsmen who have been dismissed, unnecessary physical contact, players threatening not to play in protest against an umpire's decision and ball tampering - this isn't the version of our sport that we want to project to the world. "The public reaction, around the world, to the incidents in the recent Australia-South Africa series was an eye-opener. The message was loud and clear, cheating is cheating and is not what we signed up to."